Bud Brown of Eco-Analysts Inc. talks to a crowd of people about a proposed dredging project in a cove on Southport Island Thursday. 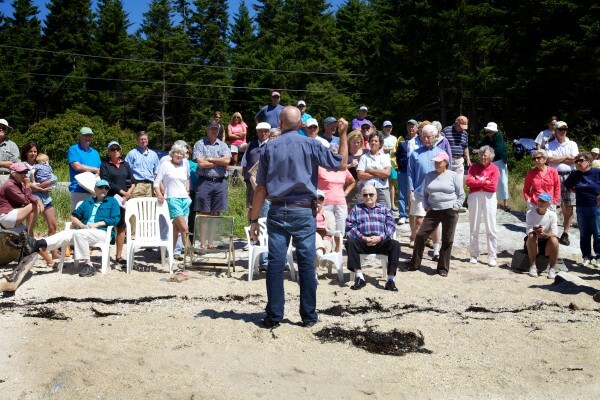 SOUTHPORT, Maine — A “preliminary” site visit at a tiny beach on Pratt’s Island off Southport grew hostile on Thursday as residents and conservationists lambasted homeowner Paul Coulombe’s plans to blast a ledge and dredge a nearby cove to allow his 29-foot yacht to access his dock at all tides. 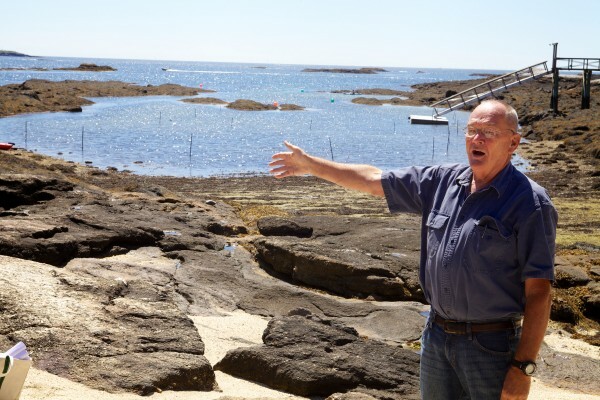 The cove, according to The Lobster Conservancy, is home to one of the most significant juvenile lobster nurseries on the northern East Coast, and opponents of the project say it would devastate that habitat. In 2011, Coulombe, the former CEO and chairman of White Rock Distilleries in Lewiston, built an 18,000-square-foot home on the east coast of Pratt’s Island, adjacent to a tiny cove and beach. Pointing past clam flats to stakes in the cove, Brown on Thursday described “a meandering channel,” about 25 feet wide just below the mean low tide line. To create the channel, some ledge would be blasted and a 7-foot-deep “hole” would be dredged in the cove. An underwater steel wall 12 feet wide and 75 feet long would be embedded in the bedrock along the edge of the channel. Brown reiterated “a legitimate concern” many had been questioning, “If we dig a 6-foot-deep hole out there, is all this stuff (on the beach) going to fall in the hole?” He added that the wall was being constructed for that reason. But the cove is home to one of the most significant juvenile lobster nurseries on the northern East Coast, according to Diane Cowan of The Lobster Conservancy, who peppered Brown with questions and comments Thursday. Although Brown said he was under the impression that “the lobstermen around here are looking forward to this” project, Jennifer Wickline, who grew up just across a wooden bridge from Pratt’s Island and lobstered in its cove, told Brown that she was shocked at “the arrogance” of the proposal. “Rachel Carson would roll over in her grave,” Wickline said, referring to the noted conservationist and author who was a pioneer in the environmental movement and had a home in Southport. “You don’t buy a house near a baseball field and expect them to shut it down when you get a few baseballs,” Alan Dutremble, who owns a summer house in the area, told Brown. Brown described Thursday’s site visit as an opportunity for residents, conservationists, geologists and others to ask questions and identify issues that would be addressed before the project would go through. “If a deal-breaker issue is identified which can’t make it through the process,” the project would halt, he said. Coulombe has held three pre-application meetings with the Maine Department of Environmental Protection, according to spokeswoman Jessie Logan, but has not yet submitted an application. Logan said the DEP would render a decision within 90 days of receiving a complete application. She said a permit from the Army Corps of Engineers would also be required. Brown said a final application would be submitted within a month, although he said a “public meeting” would take place before the application is submitted. Coulombe, who was not present at the meeting, did not return calls for comment this weekend. Correction: A previous version of this story misidentified Jessie Logan as the spokeswoman for the Maine Department of Marine Resources, and said Coulombe had submitted a pre-application to the DMR. He has only held pre-application meetings with the agency.